Unfortunately Mufasa's how-to video that shows how his mask was made was lost in a computer crash. He was constructed in the same way as all of my other masks: starting with a clay sculpt, followed by two layers of plaster wrap, then a layer of paper maché. Fine details like his eyes and snout/nose were added to him using the paper maché clay (the recipe for making that is on my paper maché page). Mufasa was painted using a variety of metallic paints, including gold, bronze, copper and silver. I started with a darker base and then applied lighter colors with each subsequent layer of paint. 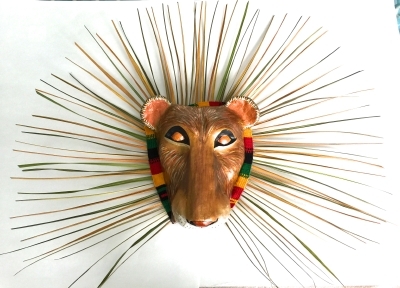 He is trimmed with a bright cloth ribbon of African colors, that I hot glued around the back of his rim. I used dried grass reeds from my garden for his mane. I spray painted the reeds a couple different shades of brown (metallic) and yellow. I hot glued them to the back of the ribbon and then I put on another layer or ribbon to cover up the glued reeds. Then I trimmed down the reeds to a manageable size so they wouldn't poke the other actors on stage. Mufasa is secured to the actor's head using the baseball cap method. The how-to video for that is on my costuming page.